This week, the general assembly of the COB, the Bolivian Workers Central, announced its support for the upcoming march sponsored by lowland indigenous groups in defense of the Isiboro-Sécure National Park and Indigenous Territory (TIPNIS). The COB also resolved to defend the law that prohibits construction of a highway through the TIPNIS and demanded that the Movement Towards Socialism (MAS) government consider alternative routes for the road. The announcement contradicts a declaration made by the COB’s executive committee just last week, that the organization “cannot join the march, which will lead directly to confrontation.” COB leaders offered instead to mediate between pro- and anti-road forces to resolve the conflict. Credit: Gregory Beltrán, La Prensa. The apparent reversal represents an important victory for the march organizers, who have called for a broad new mobilization of allied sectors in defense of indigenous, environmental, and human rights. It also highlights how growing internal divisions within the COB—and among Bolivia’s social sectors generally—have been intensified by the TIPNIS conflict. Over the past year—since the ill-fated Gasolinazo of Christmas 2010—the COB has become increasingly disaffected from the MAS government, as well as more internally conflicted. Last April, the organization sponsored widespread urban mobilizations to demand higher wages for teachers, health workers, police, and members of the armed forces. Led by sectors formerly allied with MAS, the protests disrupted services across the country but were not supported by workers in the major state sectors (hydrocarbons, mining, and telecommunications), and were actively opposed by peasant organizations who are also affiliated with the COB. Last fall, the COB spearheaded a general strike in support of the original TIPNIS marchers, following their brutal repression by police en route to La Paz. Peasant sectors, coca farmers, and migrant settlers, whose national and regional organizations are all affiliated with the COB, strongly support the TIPNIS highway and were on the opposing side of this issue. The COB declined to participate organizationally in the government-sponsored social summit last December, although many of its members (including several regional labor federations) did attend. 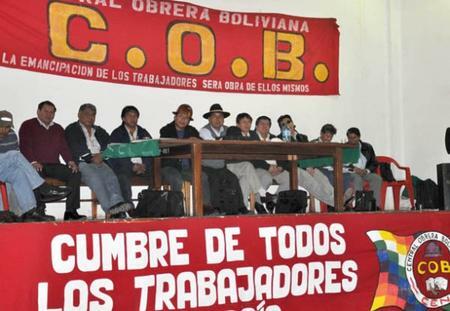 The mineworkers’ federation (FSTMB), backbone of the COB, boycotted the summit. Over the past year, pro-MAS peasant, cocalero, and colonist sectors have made an effort to become more active in the COB with the hope of muting its confrontational tendencies towards the government. Yet this is easier said than done. While peasant groups are the largest COB affiliates, existing rules limit their representation to 16% of the delegates. Workers control 51% of the delegates and “middle class” sectors 25%. Peasants can occupy only 5 of 39 national executive positions. Credit: elnacionaltarija.comThe COB’s executive secretary must be a mine worker. At its January convention, the COB elected Juan Carlos Trujillo, a miner from Huanuni, where state mineworkers have a long revolutionary history and also strongly support the MAS government. Trujillo has a more conciliatory discourse than his predecessor Pedro Montes, and has been accused of being a MAS party operative. This may explain some of the COB’s recent “doublespeak” on the TIPNIS issue. Still, Trujillo is forcefully challenging the government on the issue of annual wage increases. 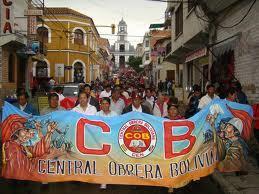 And at the same January national Congress where he was elected, the COB evidenced its continuing independence by resolving to organize its own political party for the next presidential election, based on a “revolutionary, anti-imperialist, anti-capitalist, and socialist” platform for Bolivia. With respect to the TIPNIS conflict, it’s hardly surprising that the divisions within this “big tent” workers' federation mirror those in the larger society. Where the COB finally lands on this issue could be an important factor in shaping a resolution for the controversy.